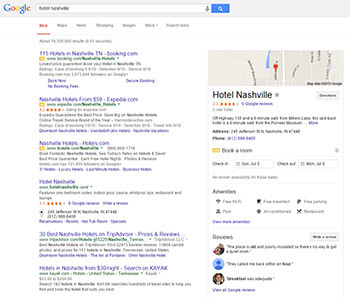 Improve Your Hotel’s SEO. Improve Your Occupancy. Every hotelier wants great occupancy. You’ve done so much to make sure that people can find you. You probably have a website. You participate in all of the online travel sites. You may even do things to advertise like taking out ads, billboards, or even a Groupon. These are just a few of the great ways that many hotels use to make sure people come to stay at a particular property. Although, there is another method to drive targeted traffic to your website-Local SEO. Optimization Prime helps businesses get this valuable traffic and increase revenue. Typically people who are looking for hotels in a given area already have a reason to be there sometime in the future. Meaning their money will be spent on a place to stay. But will it be your Hotel? That depends. If a person is searching for a hotel by going to a ‘travel deals’ site then your listing can be promoted through that particular company or you will just have to hope you come up toward the top of the listings. Then it’s base on reviews and the quality, look and feel of your property to entice them to stay. More than likely this is something that you have been trying to capitalize on, but so many people search for hotels straight from Google and skip the deal sites altogether. This leaves a whole market that can be reached by optimizing your site to rank in the search engines. That’s exactly what Optimization Prime does. What is our peak time of year? Imagine if you could rank #1 for a keywords like cleanest, friendliest, or best for business travel. The list goes on and on. What amenities are a selling point? If you have a hot breakfast, an indoor pool, or even a top notch business center they can be used to get targeted traffic that is ready to stay at a hotel that has just what you offer. What’s nearby that people would make people travel here? Convention centers, festivals, and other big draws are a big reason hotels exist. If you can rank for terms like ‘close to’ or ‘near’ these places then you will have a big advantage over the other hotels in your area. Virtually all of the people who are searching for these terms are going to stay at a hotel in your area. Plus, when they are searching for such a specific term that’s the most important thing to them. So if your hotel could be right there to answer the call then it would be hard to pass up. If you want Optimization Prime to help you obtain targeted, ready to book traffic contact us today.